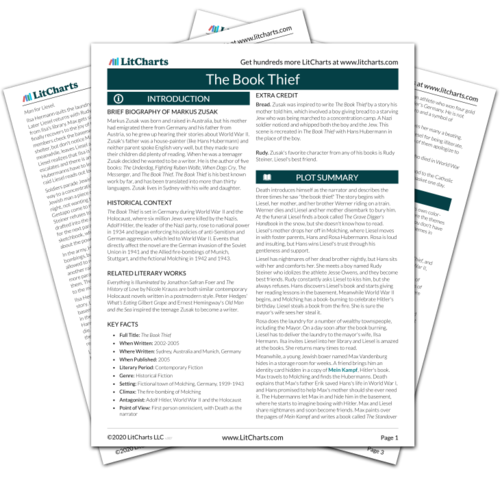 Instant downloads of all 946 LitChart PDFs (including The Book Thief). 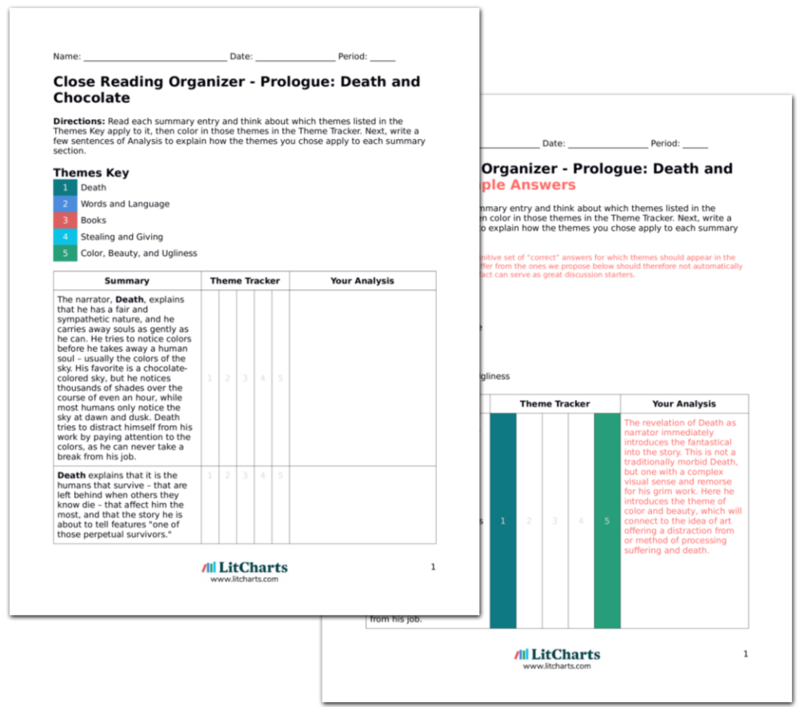 LitCharts assigns a color and icon to each theme in The Book Thief, which you can use to track the themes throughout the work. Hans and Liesel continue their lessons every night after Liesel wakes up from her nightmares. One day Hans wants to take Liesel somewhere, but first he has to placate Rosa by offering to deliver the washing for her. After the delivery Hans takes Liesel to a wooden bridge over the Amper River, where they practice reading and Hans plays the accordion. Liesel doesn't yet realize that the accordion has its own story for her Papa, but for now she enjoys the music. The Amper River will become a symbol of happiness and natural beauty in an ugly world. Here appear more positive associations with reading, Hans, and the accordion for Liesel. Zusak avoids getting overly tragic in the story by interspersing the grimness with these periods of peace and happiness. Liesel and Hans practice by the Amper River when the weather is good, and otherwise in the basement. When they run out of sandpaper Hans has Liesel paint words on the basement wall. After their lessons they both smell like cigarettes and kerosene (from their lamp), which Liesel thinks of as the smell of friendship. Words take on physical form again here as they paint them on the basement wall. The basement also becomes a safe, happy place for Liesel, which she will later associate with Max as well. Cosby, Matt. "The Book Thief Part 1: The Smell of Friendship." LitCharts. LitCharts LLC, 18 Dec 2013. Web. 23 Apr 2019. Cosby, Matt. "The Book Thief Part 1: The Smell of Friendship." LitCharts LLC, December 18, 2013. Retrieved April 23, 2019. https://www.litcharts.com/lit/the-book-thief/part-1-the-smell-of-friendship.